Reminder: You have until March 1, 2011 to get the early bird registration discount of $50 for the Food and Light food photography and styling workshop in Boulder, Colorado this summer! California does it to me every time. I get a nip of the flowers, the greenery, the warmer weather and I start feeling excited for spring despite my sworn love of winter and skiing and fleece and down. Boulder will start blooming in April well before our early mountain flowers bloom come late June, so I can travel down the canyon to get my spring fix as necessary. The difference in the seasons from one place to another can be quite drastic all due to geography. I have mixed feelings about Yosemite. It is one of the most heavily visited of our national parks and in summer it is a veritable tangle of cars and people all wanting to experience the wilderness while loving it to death. We call it the sacrificial lamb. It’s the small area of wilderness you open up to the general public in order to save and preserve the rest of the park which sees far less traffic. Woodland critters run up and beg for food when they ought to be running away from people. Part of the reason I love these stunning natural places is because I want to hear the rush of the rivers and waterfalls, the chirps of the local birds, the breeze rustling the leaves – not some couple arguing over their broken marriage (yeah, we heard that one night in camp) or car horns bellowing because we can’t be courteous to one another. We bring our outside problems in and they are at their height in summer. Traveling to Yosemite in the off season reminds me of just how amazing this place is any time of year. Have you been? The famous towering outcrops and sheer valley walls really work that third dimension. I was in awe the first time I laid eyes on the valley 18 years ago. It doesn’t fail to take my breath away today. It’s special and worth seeing at least once. The best part about the snowstorm was that it kept a good bit of the holiday weekend crowds at bay. Actually, that’s not true. The best part about the snowstorm was the snowstorm. As the clouds lifted and sucker holes (patches of blue sky) materialized to the west, the wet snow on the trees began to melt under the sunlight and fall. It felt like the aftermath of a big spring storm as we walked through the stands, pelted by a never-ending snowball fight with the trees. 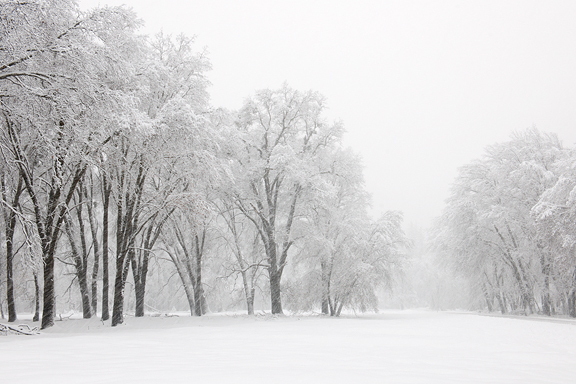 I have always held the opinion that everything looks magical under a blanket of white snow. 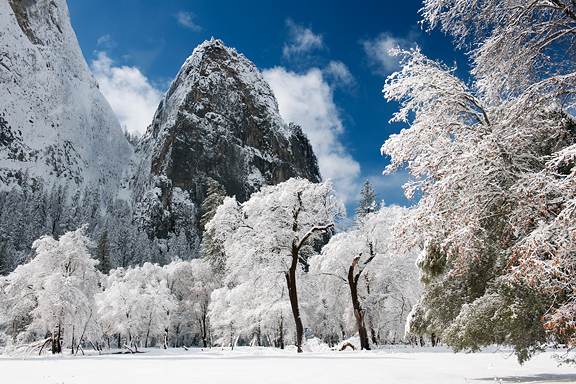 Yosemite valley looked candied, dusted, and ready to eat. You can see more of the photos from the trip on my photo blog. It’s still winter over here in Colorado, but the longer daylight hours and our bluebird days cue me to shift my cooking habits. I associate slow-cooked stews and soups with the cold and dark nights that seem to stretch on forever. Rummaging through the freezer recently, I found a jackpot of carne adovada I had prepared back in December to make life for Future Me easier. I love to cook, but if I cook and bake too much when the sun is up, I start to get ornery. I honestly don’t know how some of my friends like Shauna and Jennie crank through recipe after recipe (sometimes the same one over and over again until it’s perfect), but these ladies are dedicated baking and cooking machines. My hat is off to them. But me? 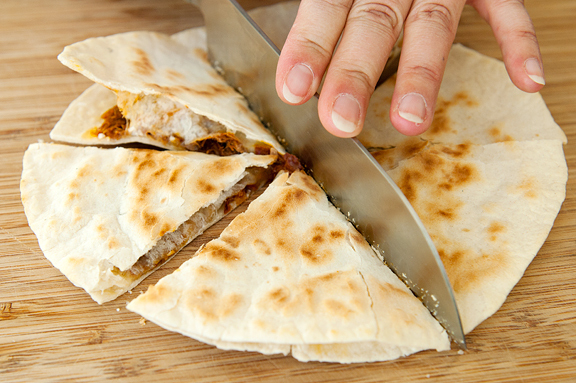 I’m a lazy bum and sometimes lazy bums just want a quick and easy quesadilla. Gosh, I don’t even know when I learned to make a quesadilla. Perhaps in college as it is simple dorm fare. I had never heard of one before college (the height of my exposure to Mexican food in southern Virginia was Chi Chi’s). We did it up all ghetto – cheese and tortillas. It wasn’t until I met Jeremy when I discovered that you can put OTHER STUFF in that there quesadilla. Carne adovada became a favorite ingredient – spicy, porky, tender, and dangerous because it stains everything bright orange on contact. If you’re going to make this, you need to have the accompanying avocado because it really brings the awesome. It’s like the holy trinity of fatty deliciousness: carne adovada, avocado, cheese, and crisped tortilla. Okay, that’s the holy trinity and friend. We’re very inclusive. Heat a skillet over medium-high heat. 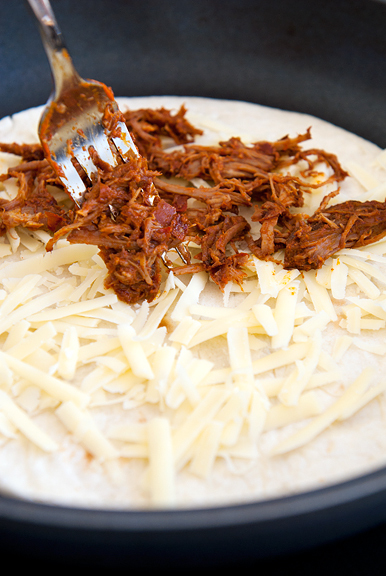 Place a flour tortilla on the pan and sprinkle with half of the cheese. 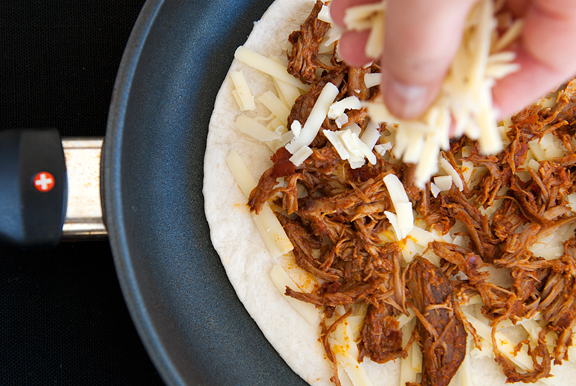 Distribute the carne adovada evenly over the cheese and top with the remaining cheese. Place the second tortilla on top. 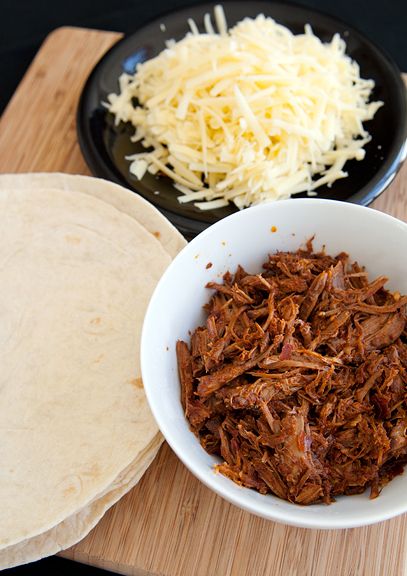 When the cheese begins to melt and the bottom tortilla turns golden underneath, carefully flip the quesadilla and let cook until the bottom turns golden. Remove from heat, slice and serve with salsa and avocado slices (or guacamole). Makes 1 quesadilla. 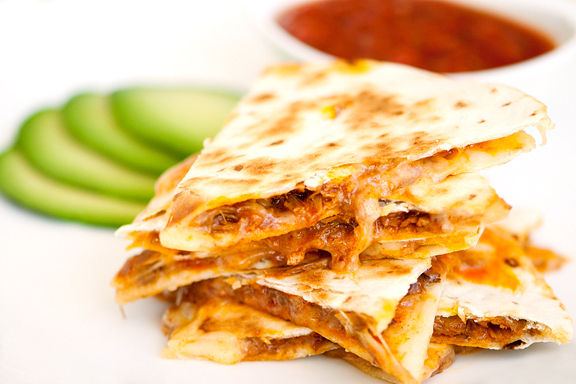 I love pulled pork and quesadillas! Those are gorgeous shots, wow. Lovely recipe, thanks. I just wanted to let you know that the right spelling is “adobada”, with a “B”. (Native Spanish speaker). I love climbing in the valley – which brings me there in the summer – with all the other goons. It is great to see it in the winter. Oh, YUM. I grew up with Chi-Chi’s only, as well, and didn’t learn about quesadillas until college. I will say, though, that I don’t think seafood belongs in a quesadilla. Something about seafood and melted cheese squicks me out. 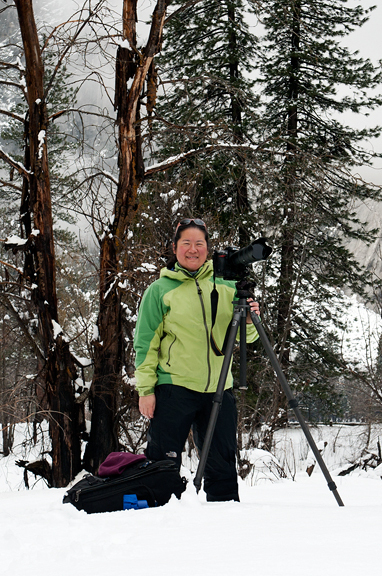 Jen, Your Yosemite photos are breath taking – exquisite! I’ve been wanting to make carne adovada!! thanks for taking me to that recipe via this post. have to go buy some red chili. I am blown away by those photos of Yosemite! I’ve never been to the park, but would absolutely love to at some point. I completely agree with you regarding how crowded nat’l parks can be during the peak season. My husband and I honeymooned in Jackson Hole, WY at the end of May, and it was so nice to hike through the Grand Tetons without swarms of people. Solitude is the way to enjoy nature! The quesadillas look fantastic! My husband would absolutely love them :). Looks delicious! Also, thank you for spelling it correctly. Other words that are spelled incorrectly most of the time: posole, biscochitos, and chile. (Native New Mexican speaker). I’ve said it before and I’ll say it again: It’s a shame you have no talent. Your photography makes me jealous as always! Just when I am thinking how sick I am of all this snow (Wisconsin). You made me fall in love with the beauty of nature all over again. Yum, I love how you made the beef. It looks wonderful. Love the nature pics and love the food recipe! Had to check what Carne Avodado was and was delighted to find out its pork with chilli! Certainly looks and sounds yummy!!! I used to regularly dine on black bean quesadillas, but it’s been a long time. I think it’s time to revisit an old favourite! Thank you for sharing your awesome photographs. Thirty years have passed since I last visited Yosemite. It’s a place I hold dear to my heart and your pictures rekindled many fond memories. Thank you. I think this may be my first time commenting on your website and I have to say, I love your stories! This looks absolutely delicious – simple yet flavorful and fun. I’m currently in Italy right now and trying to find the necessary ingredients to make a great quesadilla at a good price for a poor college student is tough! Reading through this post has definitely helped subdue my Mexican food craving (for now… :)). Thanks! Lauren – I totally agree, I love nature in part because of the solitude. I haven’t made quesadillas in years. But these look so good, I may have to break out the skillet and whip up a batch. I think they would be fantastic with sprouted grain tortillas too. Those quesadillas definitely look tasty! we knew we’d find the escape we were looking for here! 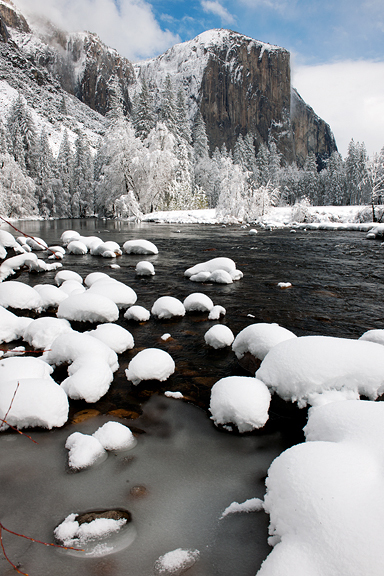 thanks for the trip to beautiful Yosemite Valley & the recipe? making it this week.